I'd heard about the famous fragility of the SMA connectors used on modern hand-helds but today I got bitten by it. I was using my RigExpert antenna analyzer to check the resonance of the stock antenna supplied with the VX-8GR (which I found to be rather broad) and thought I would check the antenna supplied with the Kenwood TH-F7E for comparison. That was sharper, but the SWR was high - the best match was at 160MHz. As I was unscrewing the antenna from the SMA to BNC adapter I heard a snap. When the antenna came off I saw that the centre pin was still in the socket of the adapter. Damn! These SMA sockets are not meant for constant swapping of antennas. 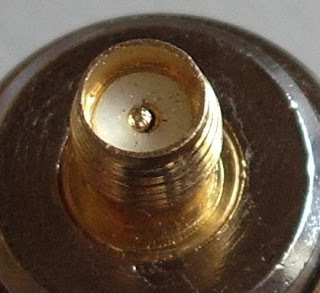 The centre pin is thin and fragile, and to make things worse the pin rotates with the antenna as you screw or unscrew it, subjecting it to a twisting action that must eventually cause metal failure. All it takes is for the female to be a bit tight, if you'll pardon the expression, and the result could be castration of the antenna. So I've had it with SMA connectors. I bought two BNC to SMA adapters several months ago and the only reason I was still using the SMA antennas is that I don't have any short BNC antennas suitable for using with the radio on my belt. But now one of those adapters will go on the VX-8GR permanently. Cheaper to replace the SMA and then sell it?